If there was ever a one-stop solution to tone up and lose weight it would have to be kickboxing. A routine that is staple not only to the Victoria’s Secret Angels, other kickboxing muses that swear by it include Padma Lakshmi, Eva Mendez and Deepika Padukone. Kickboxing works out the the overall body, giving muscle definition to abs, thighs, shoulders and glutes. The cardio burning factor is one of the reasons why this workout has caught the fitness world by storm, while also giving importance to mental focus and concentration. Whether you are looking for a cardio workout, or looking to shake things up with a bit of everything — our list will help you on your fitness journey to a sexier you. The grungy ambience of the Cult studios, pump you up as if you were on the set of Rocky. Get ready for a hour of practicing routines and punches, which work as self-defence techniques as well. Under the guidance of the instructors, you will go through a session that is broken down into strength, balance and coordination training. If you can coordinate your punches and kicks to the beats, you could be burning more than 600 calories at the Body Combat sessions at Kaizen Fitness. Redefining the fitness regime, the gym is futuristic in its approach to tracking your fitness sessions with a special device, that helps you punch in your sessions and records calories burnt. You could also join their gym, and hire a personal trainer who will customise your workout to include kickboxing. 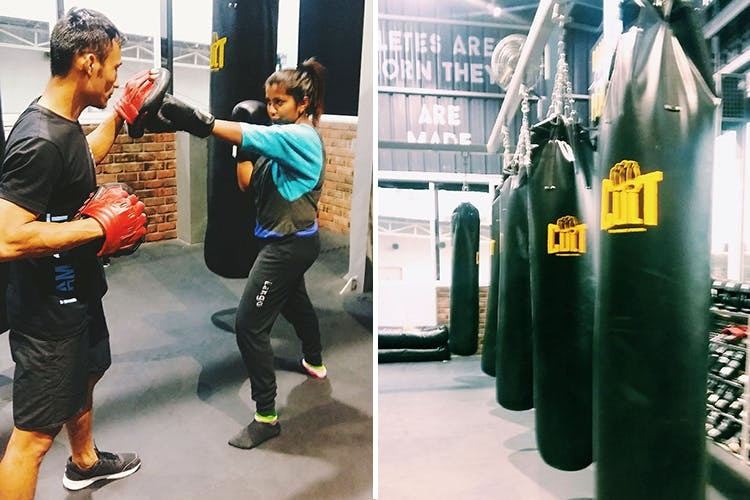 Indiranagar’s most happening fitness club uses a mix of martial arts and kickboxing in their Body Combat sessions. If you find your coordination style is more of Kung Fu Panda and less of Bruce Lee, the sessions give you a chance to practise moves from the treasure vaults of Judo, Karate, Taekwondo and more. Chisel Fitness is one of Bangalore’s iconic gyms that has gathered a loyal audience. An hour’s session that works muscle and burns fat, it is just what the doctor ordered, with classes thrice a week in their centrally located gym, you won’t have an excuse to miss a single class. The fitness club hosts kickboxing and cardio kickboxing sessions, giving you the best of both worlds. While cardio kickboxing focuses on burning fat, the kickboxing class includes toning up and strengthening muscles, which also increases your overall BMI. Now if you want to graduate into proper training, Fitness Time has a dedicated program that looks after your diet requirements and gives you an overall education on all the techniques. From footwork to circuit training, and specialised warm ups you will be on your way to practise punches on the boxing bag and pads. No, this isn’t a Hunger Games forum where you fight to the death, rather it is a specialised arena where you can learn the different forms of combat. Keeping self-defence in mind, learn moves that work on speed, resistance, and building muscle. While boxing is more focused on the upper body, kickboxing is your pick if you want to include an overall body workout.